The perfect Honda CB750 Cafe Racer? 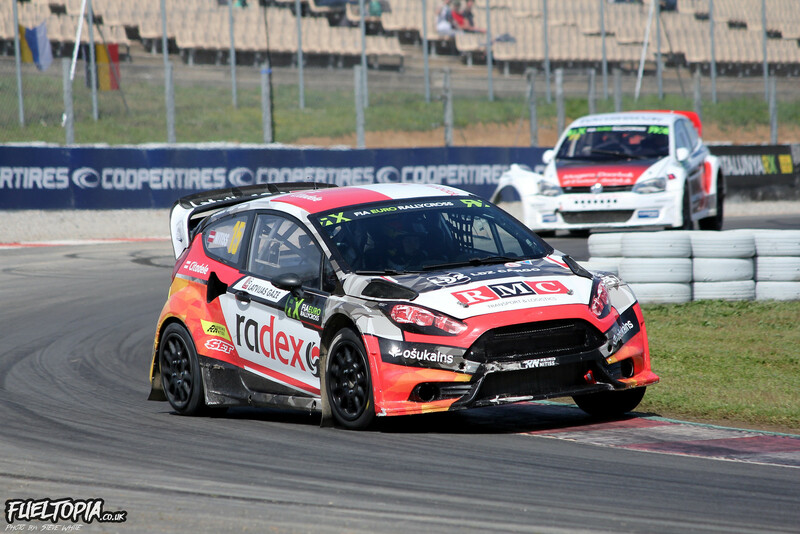 After months of rumours, teasers and awful lot of speculation, the World Rallycross Championship finally got underway earlier this month, with the season opener taking place at the Circuit de Barcelona-Catalunya in Spain. Given that I have already discussed the participants of this year’s Championship in my season preview blog, I won’t waste any time dwelling on those details and will dive straight into the action. Conditions at the circuit almost directly mirrored last year with rain during Saturday and sunshine on Sunday. That said, the rainfall was much heavier this year, with the precipitation beginning during the first round of qualification races and not relenting until the closing stages of qualifying two. 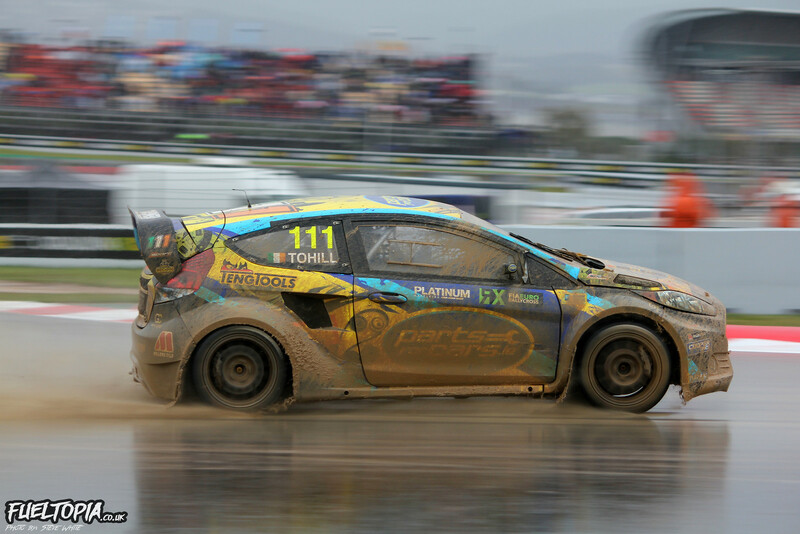 As a consequence the tarmac sections of track were completely saturated and the loose sections became slippery swamps for most of the qualifying action during the opening day. Sticking to the racing line was absolutely critical, especially on the dirt, as even slight deviations from the clean line drastically slowed the cars. Still, I wasn’t complaining about the conditions (OK, so I might have moaned a bit during the relentless downpour) as the mixed weather gave spectators a chance to see the drivers fighting with their cars in low grip conditions during the first day, then pushing their cars to the absolute limit on a dry track on day two. I am always eager to get my first look at the latest cars when a new season kicks off but, as a product of Prodrive, the new GCK Megane RS RX was at the top of my list. As expected there are countless clever details scattered around the car and I would love to be able to grill the engineers about some of the design decisions, particularly the unique configuration of the rear radiator ducting. 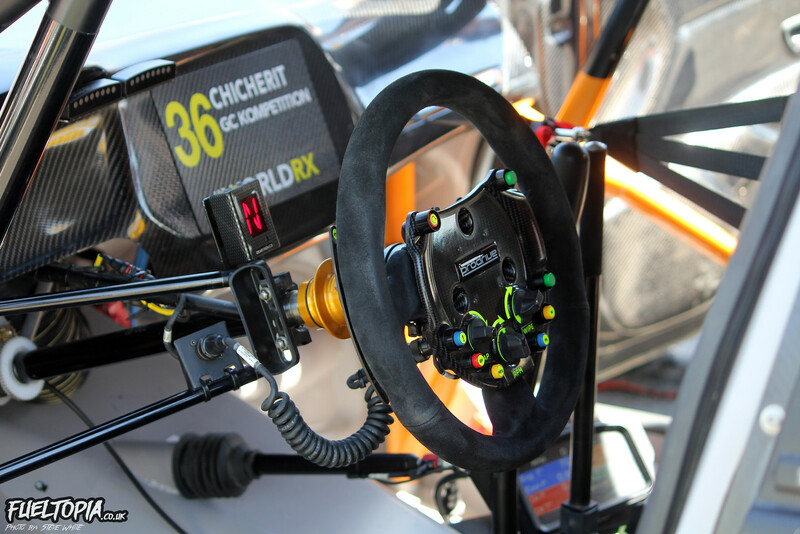 With the World Rallycross Championship due to make the switch to electric in 2020, the Prodrive Megane is particularly significant as it is likely to be the last big budget petrol Supercar to be developed for World Rallycross. Aside from the Renault, I was also intrigued by the latest iteration of the Olsbergs MSE Fiesta. OMSE have built a lot of Fords over the year and, aesthetically speaking, I have sometimes found it difficult to distinguish between the various evolutions of their cars. With a front mounted radiator setup – and thus no rear air intakes –the 2018 OMSE Fiesta is easily identifiable and, beyond that, the latest car seems to have much smoother lines than any other Ford OMSE have built. In fact from certain angles I thought the silhouette of the latest car was rather reminiscent of the 2016 Hansen 208. 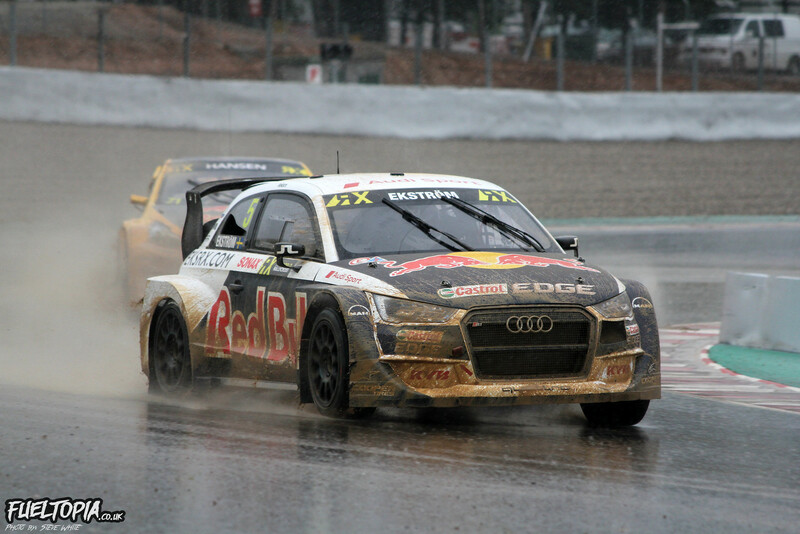 It was Mattias Ekstrom who made the best start in the wet conditions, posting a time four seconds faster than his closest rival Petter Solberg in qualifying one. First blood to EKS, but it was early days and many drivers looked to be starting cautiously. 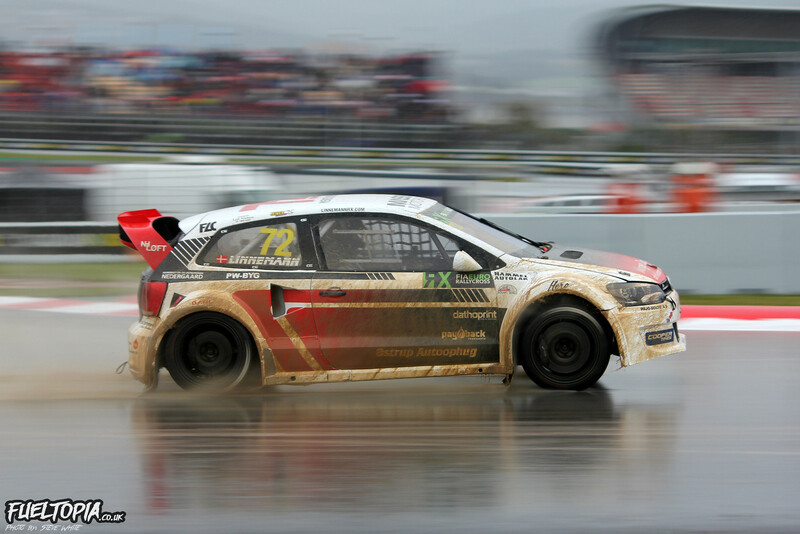 As the rain began to abate (or perhaps I was just too wet to notice it falling anymore) Petter Solberg struck back, posting fastest time in qualifying two and taking the lead of the overnight standings. Ekstrom could only manage seventh fastest time in qualifying two, but he only dropped one position to second overall at the end of the first day of racing. Where Saturday morning had been gloomy and overcast, Sunday was bright and clear, with the few clouds disappearing by mid-morning. As a consequence the sun was beating down on the circuit before the first car hit the track and the loose sections, which had been bogs by the end of the first day of racing, quickly dried out. 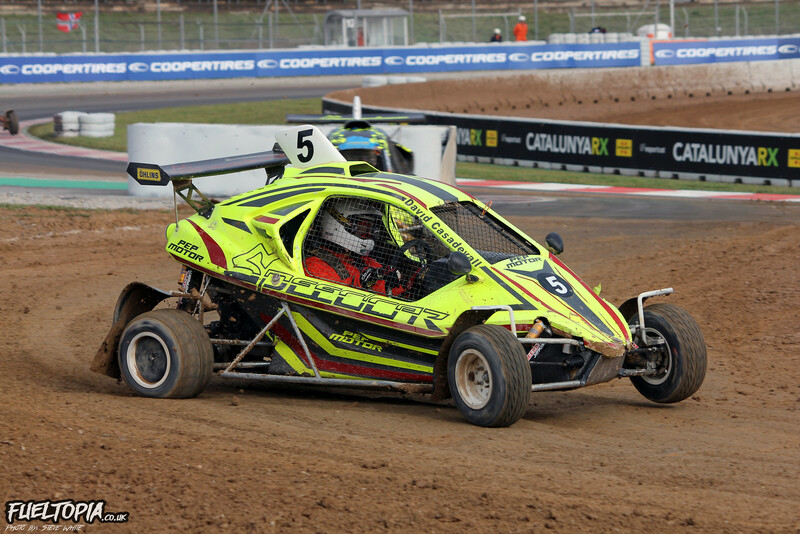 Notably the first race to take place on the second day was the supporting crosskart category and the dirt sections were drying so rapidly that you could see the racing line shifting with each passing lap. 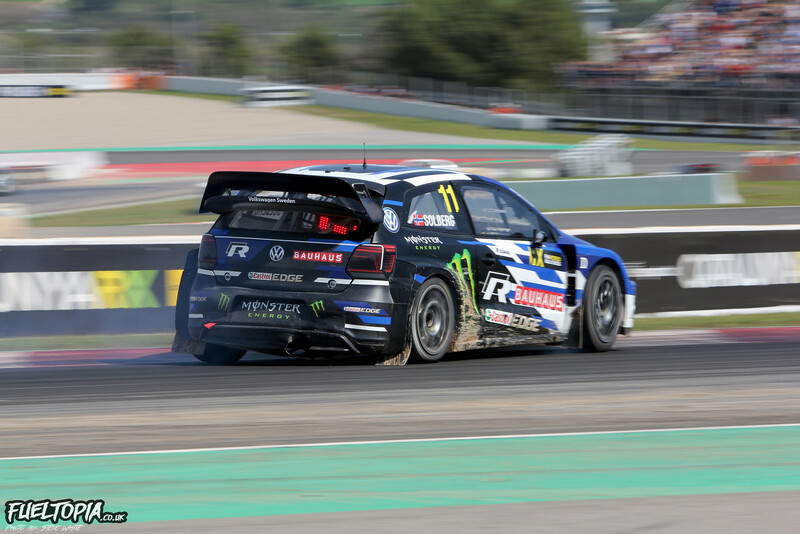 As he had in qualifying two, Petter Solberg only offered the field one view during qualifying three: the rather trick looking new rear wing of the 2018 PSRXVW Volkswagen Polo R. The drying track was obviously a factor, but it looked like Petter was going to be the man to beat. 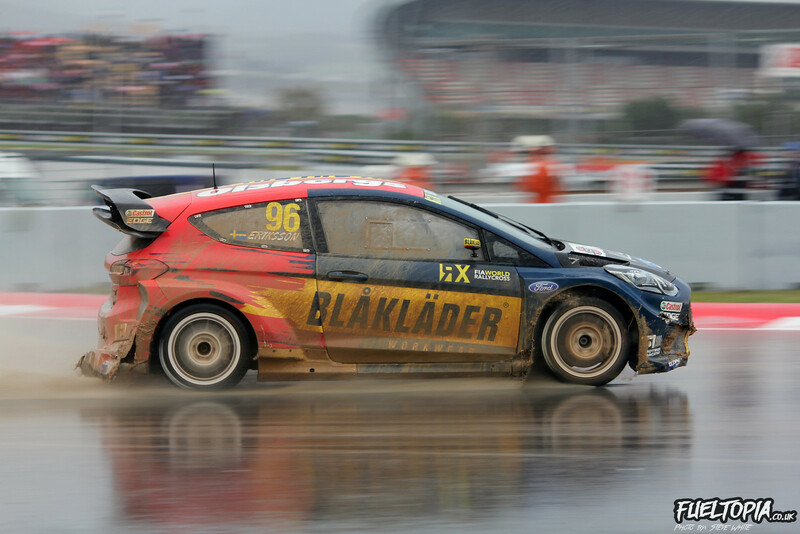 Having posted winning times in both the wet and the dry, the expectation was that Solberg would take the final qualifier. 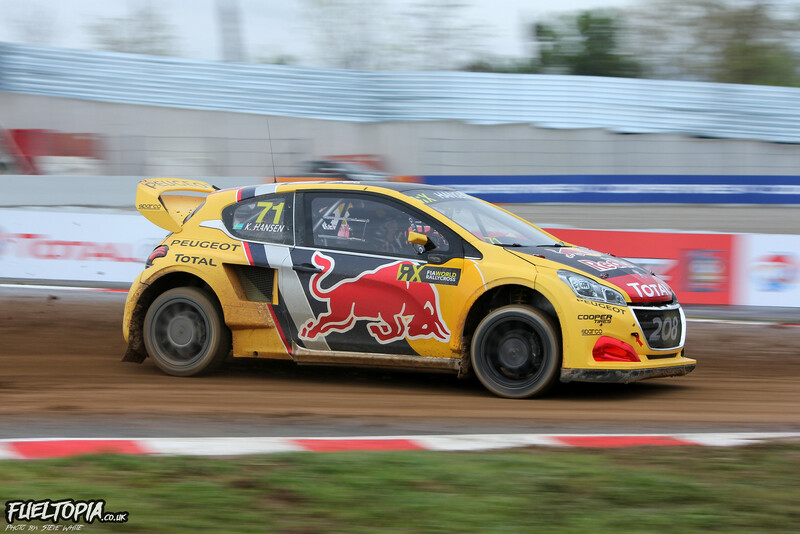 Petter was certainly pushing hard, but he was unable to shake one car off his tail during qualifying four, namely the Peugeot 208 of Timmy Hansen. With a carefully timed joker, Hansen made his way past Solberg and took the race win, posting the fastest qualifying time of the weekend in the process. Victory for Timmy would be one of several highs experienced by Peugeot Sport over the course of the weekend. Unfortunately the team seemed to experience an equal number of lows and, while Hansen was topping the standings during the second day of racing, Sebastien Loeb was desperately trying to recover from issues in qualifying two and three. Eighth fastest time in the final qualifying race moved Loeb up to thirteenth in the intermediate standings, just one place shy of a spot in the semi-finals. It looked like Sebastien was done for the weekend, however it was teammate Kevin Hansen who occupied twelfth position. Although Kevin arrived on the dummy grid prior to the start of the semi-finals, it was Loeb who lined up to race. It was a tough break for Kevin who had driven well throughout the qualifiers, however as the nominated point scorer for the team (and no doubt the big draw for the sponsors), the final semi-final slot was handed to Loeb. Timmy Hansen continued his push in the semi-final, where he managed to break away from Ekstrom and looked destined for the race win. That was until disaster struck on lap five, when the Peugeot 208 suddenly lost drive and rolled to a stop. The only positive of the situation was, as the pack slowed to avoid colliding with Hansen, Sebastien Loeb spotted a gap to bypass the line of traffic ahead of him, resulting in him leaping to second position. Given that Loeb had only scraped into the semis thanks to team orders, earning a spot on the second row of the final was justification that the decision to sideline Kevin had been worthwhile. In addition to the World Championship, Barcelona was also the opening round of both the European Supercar and Super 1600 Championships. I cited Artis Baumanis as my favourite for the 2018 Super 1600 title and Artis got his season off to a fantastic start in Barcelona. 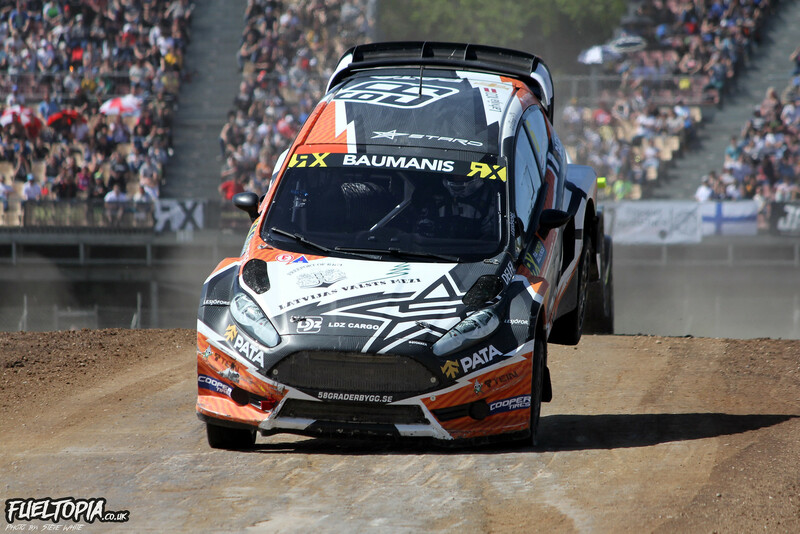 After a slightly cautious drive in the opening qualifying race, placing fifth overall, Baumanis went on to post second, first and fourth fastest times in the subsequent qualifiers, elevating Artis to the top of the intermediate standings. Winning his semi-final, Baumanis claimed the pole position spot in the Super 1600 final. 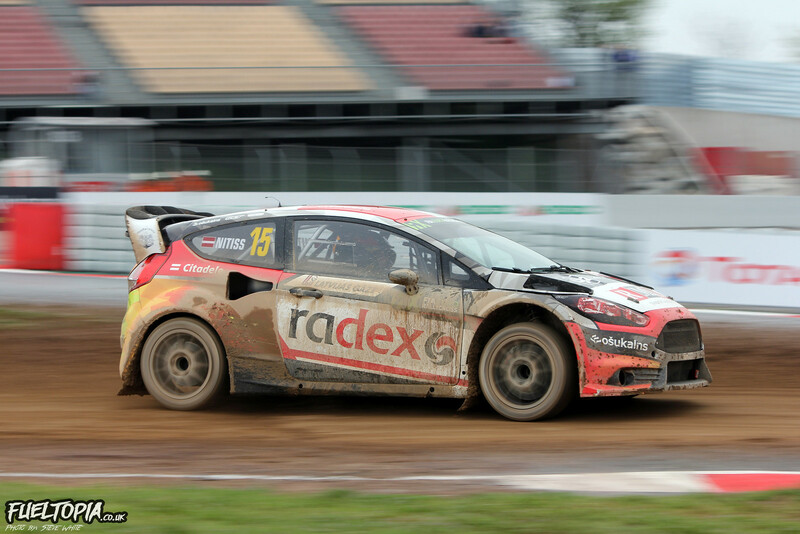 The greatest challenge to Janis during the qualifying races came from Gergely Marton and Maximilien Eveno, who placed second and third respectively in the intermediate standings. While Eveno would progress no further than the semi-final stage, Marton made it through to the second row of the final. With Gergely starting behind Artis, it was semi-final winner Jimmy Terpereau who looked best placed to threaten Baumanis in the final, however even Jimmy was unable to match the speed of Artis. Baumanis went on to win in the final by almost two seconds and with it take maximum Super 1600 Championship points. The Super 1600 cars will be back again at round 2 of the World Championship in Portugal, so Terpereau, Gergely and Eveno won’t have long to wait to attempt to catch Baumanis. 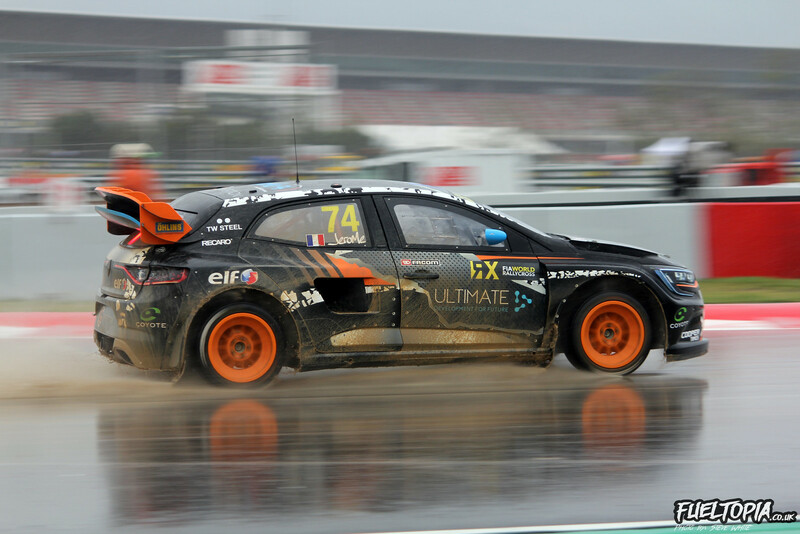 The European Supercar Championship battle got off to a familiar start with defending Champion Anton Marklund blitzing the wet track to take victory in the opening qualifying race. Thoughts of a weekend of dominance by Anton were quashed in the second qualifiers by Reinis Nitiss. 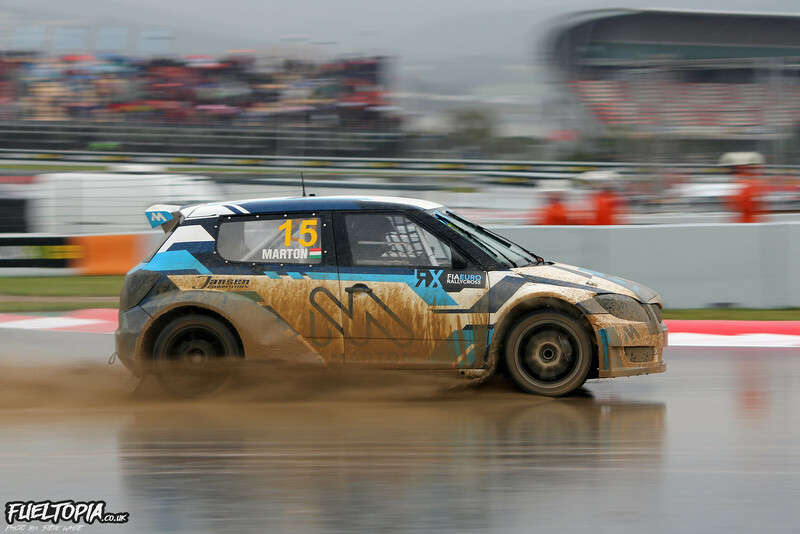 Nitiss had been outside the top ten during the first qualifying round, but he won qualifying two with an extremely rapid drive in very tricky conditions. Marklund had only been a second adrift of Nitiss in qualifying two, so I suspected we might see Anton reclaim the top spot when the circuit dried out on Sunday. Reinis had other ideas though, posting fastest times in both qualifying three and four. The M-Sport built Fiesta was the cream of the rallycross crop when it was first built and, although it’s specification has undoubtedly changed since, Nitiss showed that the ex-Niclas Gronholm Ford is still a very competitive car in the right hands. In addition to Reinis Nitiss, I was also pleased to see Ulrik Linnemann have a successful weekend. Linnemann placed second in the opening qualifying race and fifth in qualifiers two, three and four, his consistency moving him up to third overall in the intermediate standings. Linnemann lost touch with Nitiss in the first of the European Championship semi-finals, but second in that race was enough to put him in the final where he went on to finish fifth overall. Ulrik has talked about moving to Supercars for a number of years and, now he has finally made the jump, it’s fantastic to see him doing so well. Unfortunately neither of the JC Raceteknik drivers were as competitive as I had anticipated. 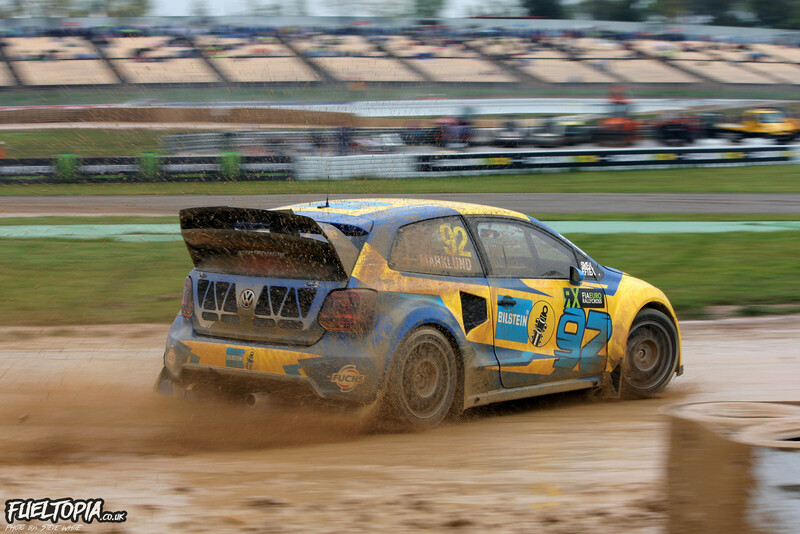 Thomas Bryntesson was one of my picks for the 2018 title, but with terminal issues in qualifying three and four he finished outside the Championship points. 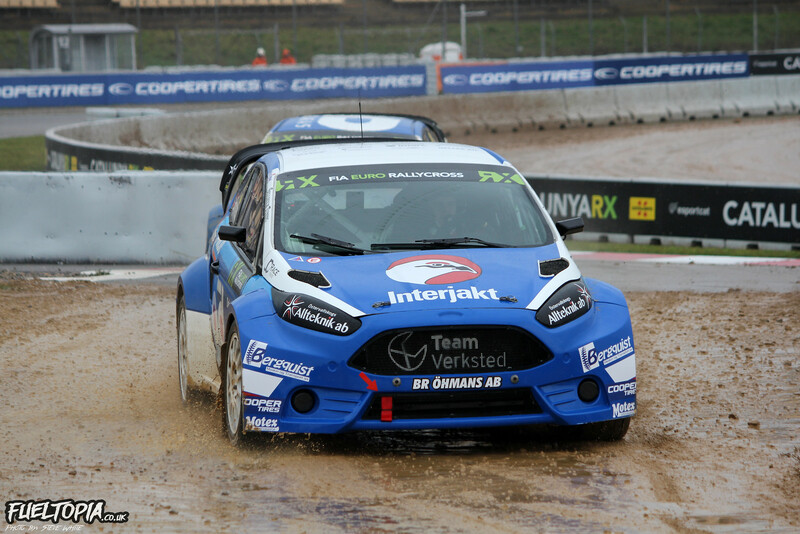 Team mate Ola Froshaug had slightly better fortune, though an issue for him in qualifying four dropped him down the intermediate classification and he was unable to crack the top three in the semi-final. The JC Raceteknik duo are going to need to top the results at the next European Championship round in Belgium if they are to have any hope of fighting for the title. Unsurprisingly it was Nitiss and Marklund who won the two European Championship semi-finals and the pair claimed a spot on the front row of the final. Notably Philip Gehrman also made it through to the final, which was a fantastic result on his European Championship Supercar debut. 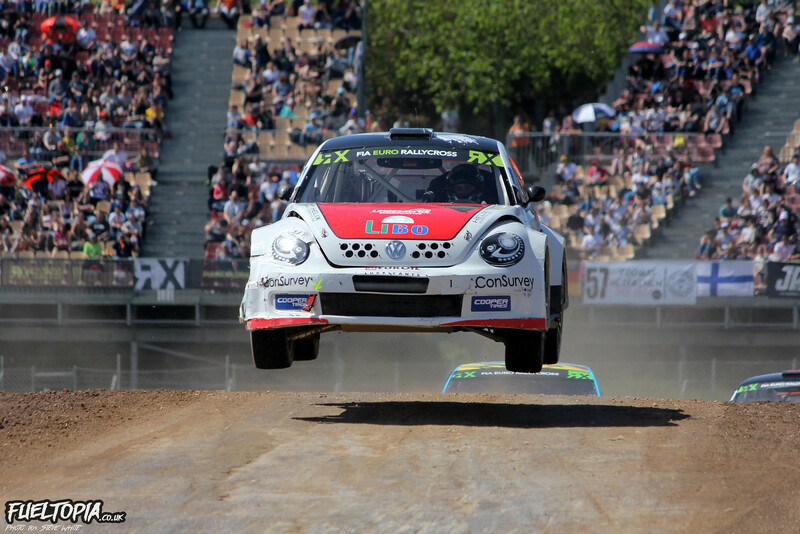 Touring Car to Supercar has always seemed the most difficult transition for a rallycross driver to make, but Gerhman drove consistently and the Eklund Beetle proved reliable throughout the weekend. 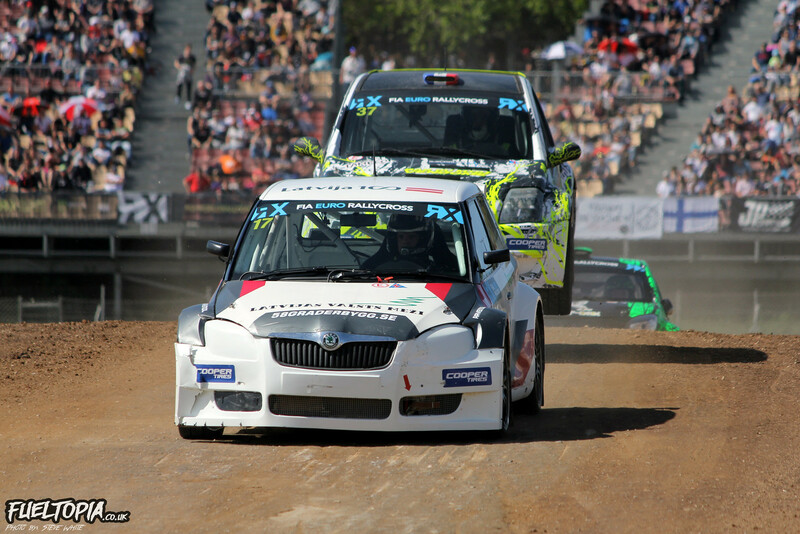 When the lights went out in the European Championship final Nitiss got away clean while Marklund seemed to go backwards, dropping from second to sixth before the pack reached the first corner. Anton managed to work his way up through the field to reclaim second, but by that time Reinis had a comfortable three second lead. The gap between the pair fluctuated slightly throughout the race, but Nitiss never looked under threat and Marklund had to settle for second. Completing the European Championship podium was Jean-Baptiste Dubourg, who brought the G-FORS Clio home to a well-deserved third. Dubourg was just a couple of seconds adrift of Marklund, so if Jean-Baptiste can wring a little more performance from the car, he could be a potential race winner this year. For now though, all eyes will be on Nitiss to see if he can maintain his speed in Belgium next month. After their absence in the World Championship I had been hoping to see Olsbergs MSE doing well on their return and, although Barcelona wasn’t the most successful weekend for the team, there were at least some positive signs. Kevin Eriksson struggled on the opening day of racing and as a consequence failed to make it past the qualification stage, however four top ten times for Robin Larsson placed him a respectable seventh in the intermediate standings. Sadly Larsson wasn’t able to capitalize on his second row semi-final grid slot and he was knocked out before the final. The new Fiesta scored several race wins in the qualification stages though, so I hope we see both OMSE cars have a more consistent weekend in Portugal. As the World Championship finalists formed up the sound of anti-lag echoed from the grid of the Circuit de Barcelona-Catalunya for the last time in the weekend, which brings us to the moment of round one that has drawn the most attention. Before getting to the headline grabbing front row contact though, it’s worth mentioning the back of the grid where, sitting alongside Andreas Bakkerud, was Niclas Gronholm. Given that sightings of the GRX i20 were few and far between during the off-season I wondered if it might be the surprise package of 2018. The early signs certainly seem encouraging as both Gronholm and Timur Timerzyanov made the semi-finals and Timerzyanov was just one position shy of joining Niclas in the final. With Solberg on pole and Ekstrom lining up alongside him, it seemed inevitable that some paint was going to be traded at the first corner. What transpired went rather beyond rubbing, as Mattias edged ahead of Petter off the line before turning across Solberg and forcing him into the tyre stack on the inside of turn one. Disregarding my personal bias as a fan of Petter, I thought the manoeuver was unacceptable as, aside from the contact, Mattias line took him well outside the track limits. 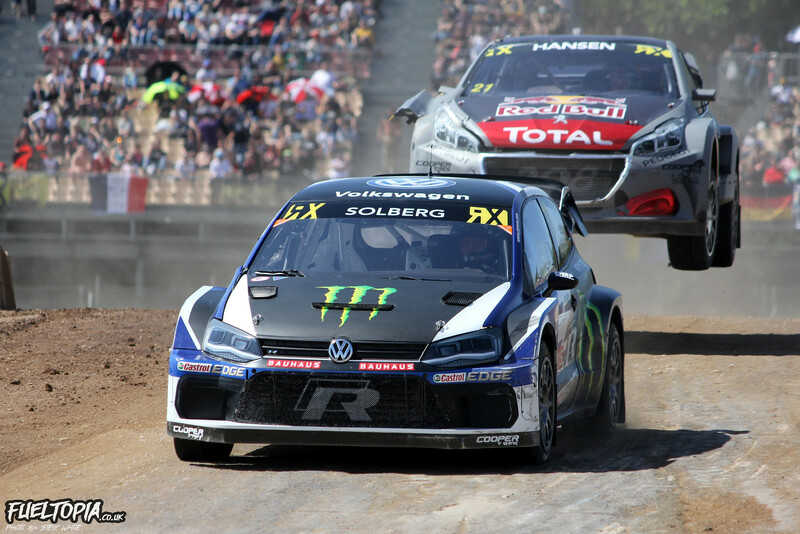 The exodus of Solberg left Ekstrom with an empty track ahead and breathing space behind, enabling him to concentrate on putting in many clean laps as possible. Petter did eventually re-join the race and, despite the huge gap to fifth, set off in pursuit of the distant pack. I am yet to see any onboard footage from Solberg during the final but, based on the manner in which he was driving, I think he might have been a bit annoyed. …however Ekstrom had barely crossed the finishing line when the timing screen denoted that the turn one incident was under investigation. Following several hours of discussion, it was revealed that Mattias had been excluded from the final. l don’t envy those in the position of making such decisions but, in this case, I think they made the right call. With Ekstrom out of the results, Johan Kristoffersson was promoted to first with Sebastien Loeb and Andreas Bakkerud moving up to second and third respectively. Given that Loeb had only made the semi-finals thanks to team orders and the final thanks to the demise of his teammate, second was an incredible end to a roller coaster weekend for Sebastien and surely satisfying for the Peugeot Sport team. 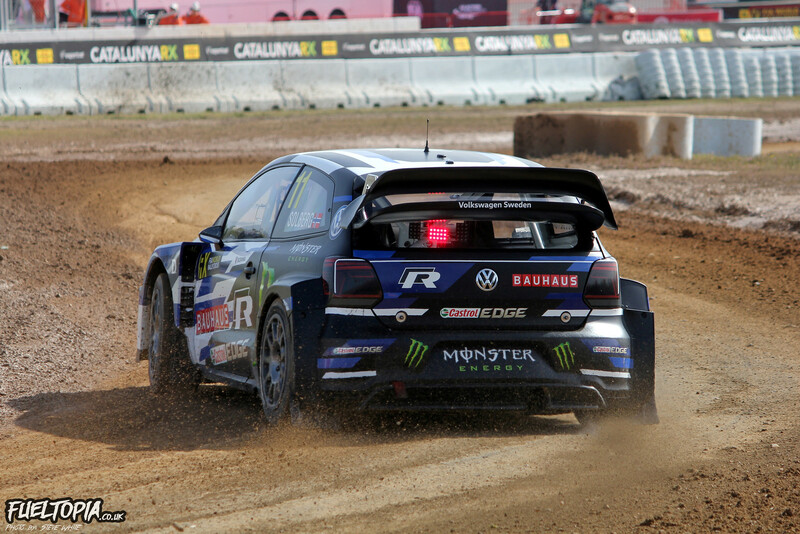 The disqualification of Ekstrom was certainly a dramatic conclusion to the opening round of the Championship, but was far from the only thing to take away from Barcelona. Audi Sport look to have extracted enough speed out of the S1 to put it on par with the PSRXVW Polo and the Peugeot Sport 208 looked incredibly rapid when it was running trouble free. 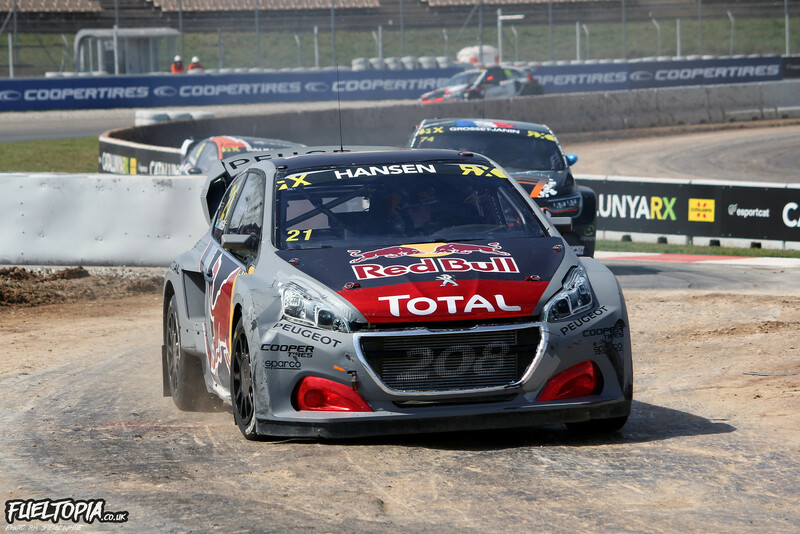 Peugeot Hansen have typically made a slow start to the season in the past, but if the reliability issues on the works version of the Peugeot 208 can be addressed early in the season, it could become the car to beat. 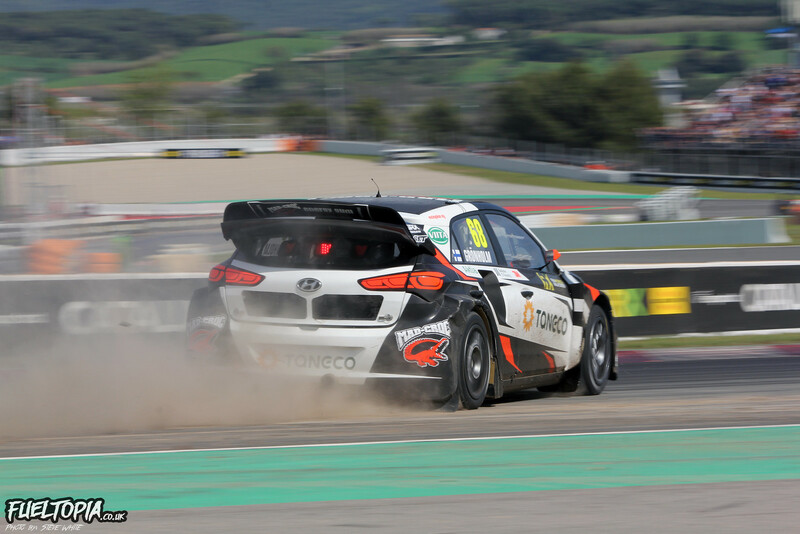 On top of that Barcelona saw strong performances from the two GRX Hyundai i20s, Baumanis in the STARD Fiesta and both of the GCK Megane RS RX making it to the semi-finals. The latter was perhaps the biggest surprise as, although I am in no doubt the car is incredibly capable, I wasn’t sure how the GCK drivers would fare. 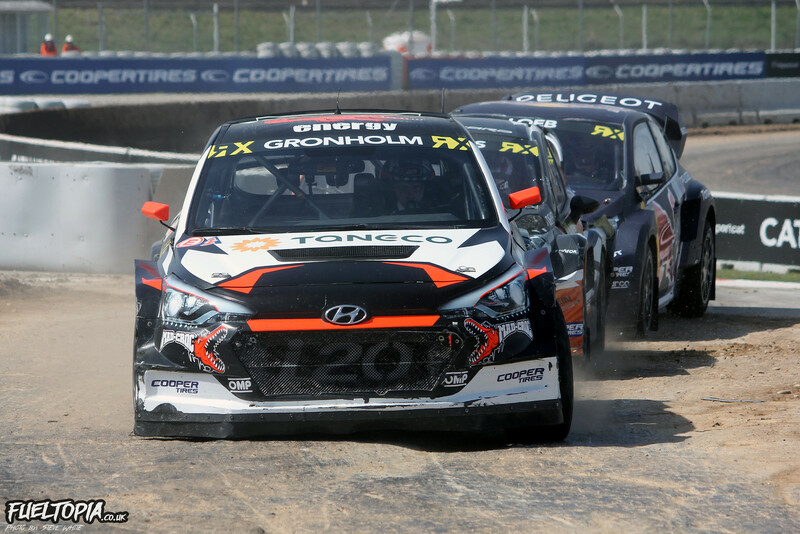 The World Rallycross Championship heads to Portugal for round two this weekend, where I’m sure there will be some fireworks between the Championship front runners. Sadly I won’t be there, but expect more World Rallycross content on Fueltopia next month when the Championship travels to Belgium for it’s third round. 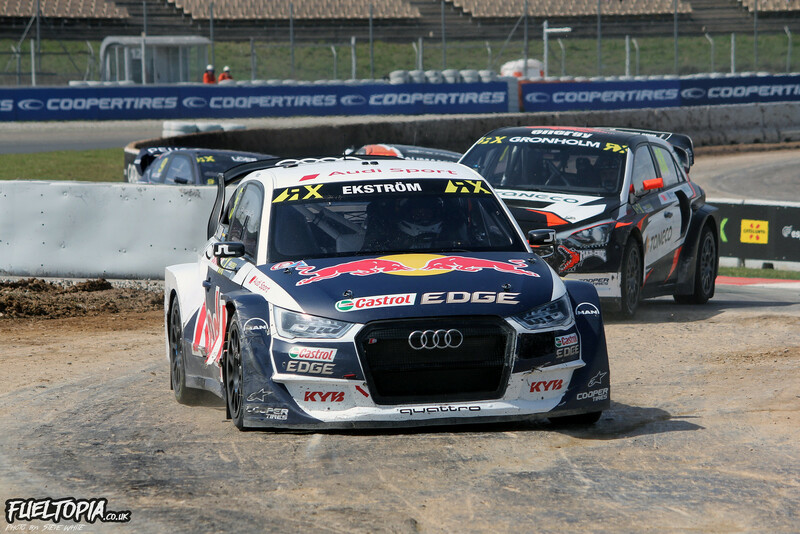 Want to see more of the World Rallycross Championship at Barcelona? Click here for a full image gallery.